I am not that fussed about a nip of whisky, vodka, rum or brandy but gin…. well….. Lets hope that World Gin Day lasts as long as it possibly can! Until I made this I didn’t think it was possible to drink gin straight up, come to think of it too many blackberry gins and lying down will be your only option. Flavoured vodkas are all over the place, fruits are being pureed into beers and ciders and even McDonald’s is promoting a fizzy fruit juice with it’s Happy meals. Fruit based drinks are here to stay and they are not just for the ladies. Foraging for blackberries is a joy. In our house this has turned unsurprisingly into a competitive sport. Who picks the most, biggest, gets the messiest, has most prickles in their fingers etc etc. We back onto a railway line and have a bridle path nearby so as long as we pick those above dog leg cocking level we are pretty safe. It is a skill to pass on as so many of the children around here must think food only comes out of the back of an Ocado delivery van, (I live in Surrey remember!) My two pop out and pick the blackberries if they have nothing better to do. The bribe of an apple and blackberry crumble at the end makes it all worth while. For me, as much as I love a good crumble, blackberry gin is the star. The best bit is you can still use the berries once the gin is made but more of that later. Put the jar though the dishwasher, or sterilise in the oven. Allow to cool slightly. Tip in the washed berries and the sugar. Top up with gin. Screw on the lid. Invert the jar several times until the ingredients are well combined. Place in a cool dark cupboard. My jars sit next to the cereals! Daily for the next two weeks invert the jars a couple of time. The sugar will become a syrup and the colour of the gin will darken. 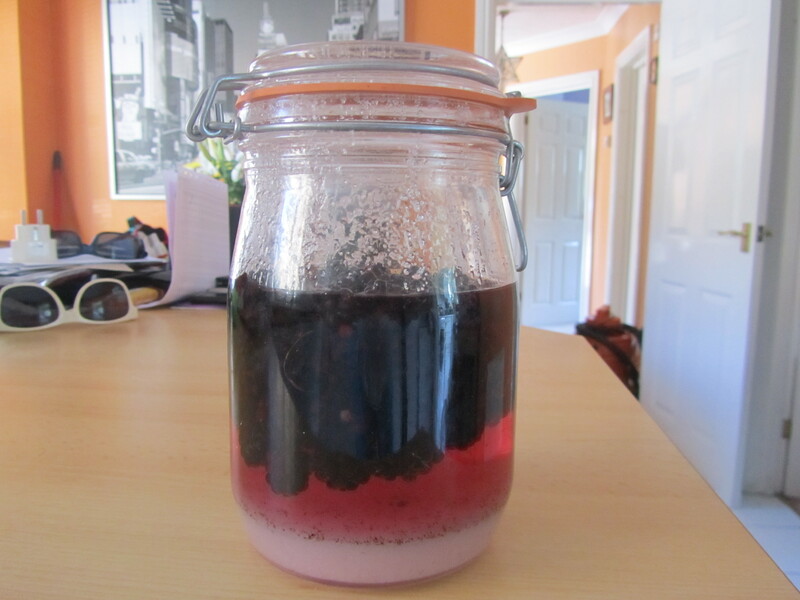 After two weeks continue to invert the jar every couple of days for another fortnight. Once a month is up strain the berries out from the liquid. You can now decant the liquid into a bottle of your choice. I use one from Lakeland, but have resorted to a clean screw top wine bottle in the past. The berries now soaked in gin can be used to make a very adult blackberry and apple crumble or simply poured over very good vanilla ice cream are delicious. Leave the gin to mature, I find that three months is a goodly amount of time. This gets you towards Christmas if you started in July or August. You can also make this very easily from frozen berries at any time in the year but personally I find it tastes even better if you have picked the berries yourself. Magnificent as a digestif, brilliant as the base of a cocktail or just as the world’s best cough mixture. Don’t just stick to blackberry and apple pie next time you pick some blackberries treat yourself to some of this. Chin chin! I am pretty sure you can use this recipe to make raspberry, strawberry or use elderflower syrup to make elderflower gin. Hmmmm there’s a thought, now where is my bag and secateurs ……. I’m adding this recipe to the Great British Blackberry recipe round up run by Farmersgirl Kitchen and Lavender and Lovage. I’m so excited to see all the recipes we bloggers come up with. Blackberries are one of my favourite fruits, and what’s more they are often free. Urvashi, it is just so smooth and delicious. I am not a vodka woman so gin it has to be. Free food always tastes good too! My daughters prefer vodka, so I only make blackberry gin! Just made my first batch can’t wait to try. Oh, I’m sure you will love it. This looks fabulous I can only imagine the lovely rich flavour the blackberries add to the Gin. Many thanks for joining The Great British Blackberry Recipe Round Up Linky Party. 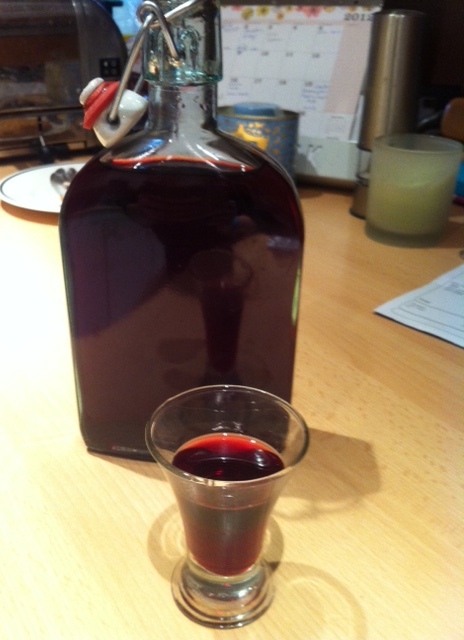 It makes a fab aperitif, digestive or even alternative to cassis in a Kir Royale. Thank you for hosting.